During the early 1900s the Osage experienced ups and downs tied to the petroleum production on their reservation. The Great Depression was a difficult time for the Osage. Many oil wells had to be shut down. Dormant oil wells could not be reactivated easily, and the Osage could not afford to reactivate the wells for nearly a decade. Only the needs of World War II justified the expense of reactivating these wells. When oil was discovered in Oklahoma, Euro-Americans found a new way to exploit the Osage for resources through cultural differences in property rights. Oil revenues belonged to a woman’s family and were under her control under Osage customs. A husband had control of properties and revenues from oil under the United States’ laws. Several Euro-American men married Native-American women who owned land in order to take advantage of the resources. There were a number of cases in Oklahoma of Native American women being murdered so that their husbands could gain control of their wealth. This is one of many instances in the United States’ history of Native Americans being victims of lust for resources and wealth. The Osage served for the United States in World War I, even though they were not citizens of the United States at the time and thus were not obligated to accept the draft. 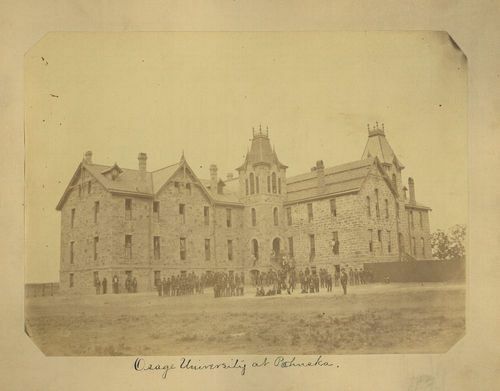 One in three Osage responded to the draft, which was a higher ratio than the rest of the United States’ population. A total of 519 members of the Osage Nation served during World War II. Osage members who served in World War II were not able to obtain loans under the Servicemen’s Readjustment Act of 1944. A special act of congress had to be enacted to enable Osage veterans to receive that benefit. The Osage history with the Jesuits set the foundation for Catholicism among the Osage today. The Osage established the oldest Catholic Parish in Oklahoma, Immaculate Conception in Pawhuska, in 1887. The stained glass window of the church depicts the Jesuit, Father John Shonmakers, along with a band of Osage in traditional dress. The Parish is 80 percent Native American, which is the highest percentage of Native Americans in any Catholic Parish. 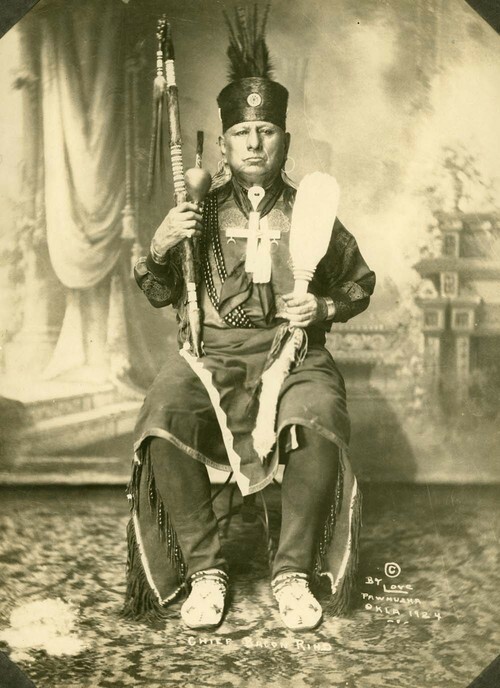 It was estimated that, as of 1989, nearly 80 percent of the Osage were Catholic. Some traditional Osage practices blended into Catholic beliefs, and the church has even allowed Osage burial practices in Catholic funerals. The American Indian Peyote church in Osage County, Oklahoma, incorporates even more of the old Osage religious practices into its ceremonies. The Osage Nation has been actively working toward a cultural renaissance. The Osage Tribal Museum opened in Pawhuska, Oklahoma in 1938. It was the first tribal-owned museum in the United States. The Osage Nation also has a cultural center and a language department that work to revitalize the Osage language and teach members of the Osage Nation to speak it. As of 2011 the Osage Nation has 13,307 enrolled members.